Abstract: Belgrade Car show has earned a well-deserved reputation among the car manufactures, dealers and the related industries. The Belgrade Car show 2016 begins from 17th March lasting to 23rd. the seven day exhibition has attracted a host of leading worldwide car manufacturers to show their brand new products. 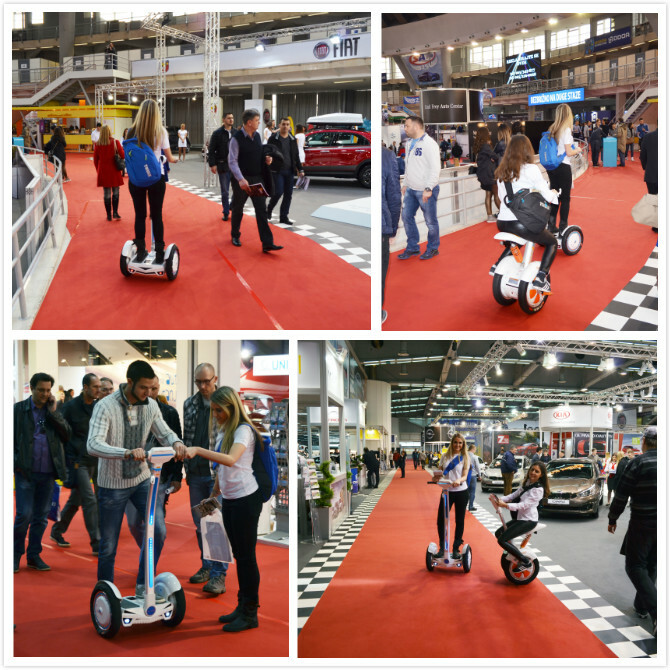 Airwheel, dedicated to portable intelligent transport, shows on the Belgrade Car show. Belgrade Car show was first held in 2016 and once in two years. Within the decade’s development, Belgrade Car show has earned a well-deserved reputation among the car manufactures, dealers and the related industries. Also, the exhibition involves the car related industry, such as the spare parts and equipment, as well as garage service equipment. On the spot, Airwheel is even more popular than the luxury cars for its mini size and faddish design. Airwheel has selling its products into sixty countries covering five continents. Of course, the Serbia market is included establishing its own sales channels. Moreover, purchasers can easily find Airwheel self-balance electric scooters on hundreds of main chain retail institutions in United States, Dubai, Netherlands and Norway and so on. In combination with the construction of the global B2C portal platform, Airwheel is covering main target markets in the world. On Belgrade Car show, Airwheel provides guiding and trial riding service. Visitors have queued up to experience the magic of Airwheel electric hoverboards, especially the two wheel self-balancing electric scooters, such as Airwheel S3, S5 and A3. Though Airwheel is specializing in intelligent electric scooter, it is harmonious with the general atmosphere of the trade fair. Advocating portability and environment production, Airwheel was born not to replace the cars, but to provide riders with solutions on short to medium travel needs. To be the backbone for boost the intelligent lifestyle, is not only the original vision of Airwheel, but also the role Airwheel is going to play in the future with an international vision and innovation ability. Previous：What happened on Hall 17-H06 at CeBIT 2016?